Seems like everyone is following the same tutorial, good to know! I dont think its common for only to go out no. I remember when i did my conversion they both would flicker a lot and i would get errors on the dash. Good news is that your headlights are OK and only your ballast or bulb might be bad which in that case its a cheap and easy fix. Fishcake seems like a good seller i am sure he will take care of you. Like i said though to give you some peace of mind try switching the ballasts and see if one works and the other one doesn't. Also pic of your car with them on please? Didn't get a chance to make a DIY but if you YouTube w204 headlight removal, I followed the first hit. As for the headlight is this a common issue for only one to go out? Or if it is truly a computer error should both be out? The guy in the video makes it look so easy. 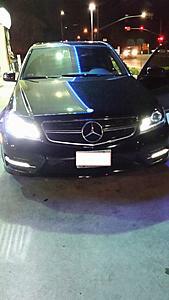 His car is a pre-facelift W204, so were there any major differences between the video and your car? Would you consider putting halogens in? How much work would it take to de-retrofit the HID system? One of the kits on ebay already comes with the HID kit installed. After that its plug and play. I always buy from DDM. I've only ever had 1 ballast go bad in the 7-8 cars & 3-4 bikes I've installed them in for the past 4 or so years. I have so much extra because I always pull them out before I trade in a car and the next car NEVER uses the same bulbs and bikes only need one bulb but it's cheaper to buy a full kit. Retrofit is a great source for retrofitting parts and kits but for just a basic PnP kit they are way overpriced and sell the same stuff as ddm. Left headlight still out... Any help? Losing sleep over here trying to figure out what went wrong since it worked fine for the first 10 mins! Last edited by sev7nflow; 04-30-2014 at 10:47 AM. Did you swap ballasts per clkboi's suggestion? I'm not sure if they are fused or not, but I suggest searching the forum. You could also try removing the ballasts and installing halogens, just to see if they turn on. I am losing faith in whatever cheap HID system the eBay seller bundled with the headlights. Not sure what dual filament bulb is...but the fishcake mentioned there's a shield/shutter inside the projector that controls the high/low beam pattern..maybe Seven can confirm? This, have you washed the car yet? They don't make a 9005 dual filament bulb, how is the projector high and low? You got ripped the **** off on your HIDs. This is my current spare / left over collection and there's maybe $100 here. Shame that these can only go on '12+ models? Or can they work on 08+? 12+ only unless you change the hood! I was doubtful of this but after watching the video on page 2 again I think this is likely the case. You can see how the color temperature does not change when the high beams are switched on and the cut off line seems to disappear. That would indicate to me it is a true bi-xenon setup. This is impressive. The only reason I am assuming the h7 "cornering lights" are coming on when the high beams are switched on is so that the car doesnt think there is a bulb out. I had mine installed today. It's working great and it is a bi-xenon setup. The ballasts are getting really hot. I am not sure if it's normal. DO you mind taking some cutoff pics? I received my headlights today but seems like no shops are open on Saturday here in Seattle. Mine were delivered today and I installed them myself. They seem to be working well, but I only drove around for about 30 minutes. I'd like some feedback from the HID experts on here about the cutoff as shown in the attached pic (sorry for the excessive noise). It seems low, and when I was driving I felt as if not enough road was illuminated. The cutoff is also very well defined, as you can see in the pic. Do I need to make some adjustments? Thanks for taking the pic. Seems like the headlight is aiming really low...when you say the light isnt illuminating the road enough, do you mean width or distance? also, did you have to take the bumper off? I mean distance, which would make sense since it is aimed low. Do you know how this is adjusted? I did not take the bumper completely off, I loosened it so it would hang down just like in the Youtube video previously mentioned in this thread. I dont have the headlights with me...but i would imagine you should be able to adjust them just like the oem halogen headlight. There should have adjusters on the housing. I have S2000 Projectors retrofitted inside my OEM headlights. No more ugly halogen....They are really nice and the cutoff is perfect, just need to align them still. I'm running 6000k 35W ballasts. I will post some cutoff pictures tonight. First thought was wow beautiful. Installed them with no issues and they work like a charm. For anyone looking to DIY this is no big deal. 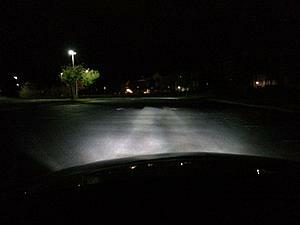 Simply follow the steps in the video and you should be OK.
Only worry with these headlights are bulbs going bad! If any of the bulbs burns out here dont even think you will be able to change them from the engine bay. 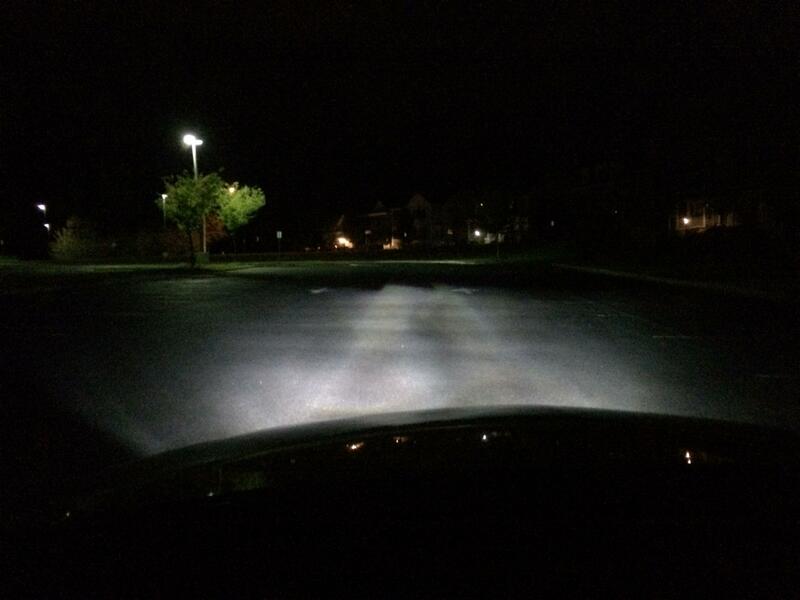 MAYBE the Low Beam if you have tiny hands but as far as the high beam forget about it. Really hoping these are good quality but time will tell. Fitment is 99.9% OEM. I notice these headlight stick out from the hood a little more then the regular halogens. Light output is great i didn't even need to register the beam. Cut off was perfect on mine. Definitely a head turner though and they change the image of your car so much. For anyone thinking to buy id say go ahead you wont be disappointed but be ready to do some work if they go bad. Some pic. Taken at night excuse the quality. If anyone needs to see additional ones at certain angle let me know! Last edited by Clkboi; 05-03-2014 at 10:33 AM. To adjust the lights screw the screw on the top right of this picture. Same as the stock lights. Thanks. It required a 7/32" hex key.